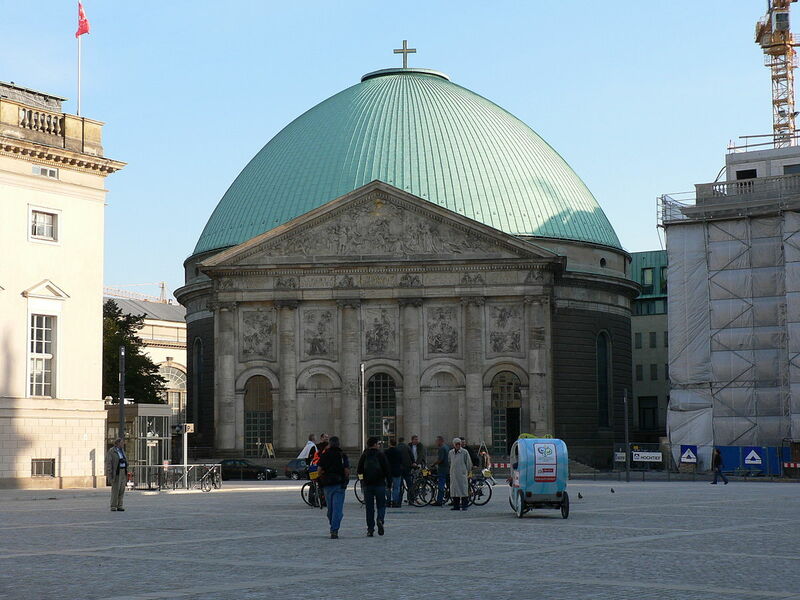 St. Hedwig's Cathedral is the seat of the archbishop of Berlin. 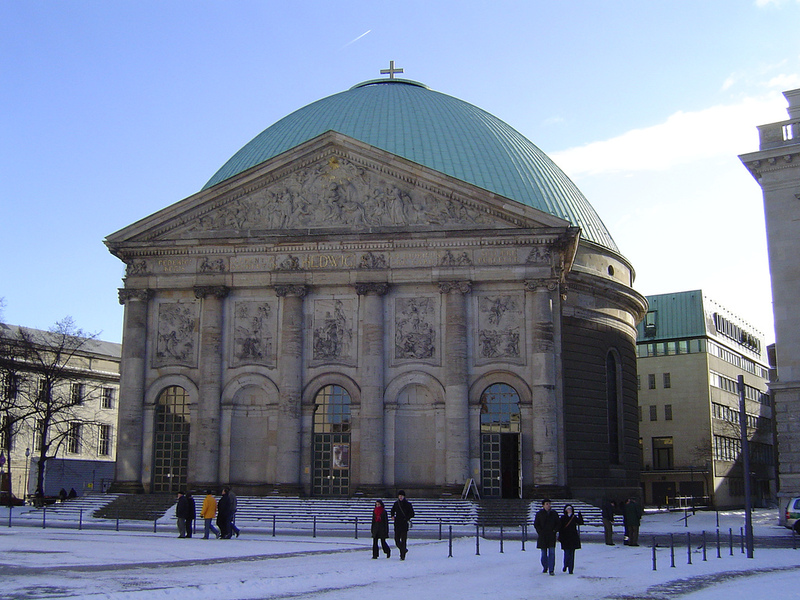 It was built in the 18th century as the first Catholic church in Prussia after the Protestant Reformation by permission of King Frederick II. The intention of Frederick was to offer the numerous Catholic immigrants who had arrived in Berlin, especially those from Upper Silesia, a place of worship. The church was therefore dedicated to the patron of Silesia and Brandenburg, Saint Hedwig of Andechs. The building was designed by Georg Wenzeslaus von Knobelsdorff modeled after the Pantheon in Rome and construction started in 1747, interrupted and delayed several times due to economic problems. It was not opened until November 1, 1773 when the king's friend, Ignacy Krasicki, then Bishop of Warmia (later Archbishop of Gniezno), officiated at the cathedral's consecration. 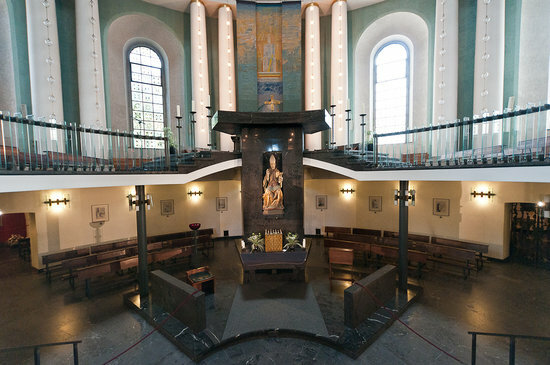 After the Kristallnacht pogroms that took place over the night of 9–10 November 1938, Bernhard Lichtenberg, a canon of the cathedral chapter of St Hedwig since 1931, prayed publicly for Jews in the evening prayer following. Lichtenberg was later jailed by the Nazis and died on the way to the concentration camp at Dachau. In 1965 Lichtenberg's remains were transferred to the crypt at St. Hedwig's. The cathedral burned down completely in 1943 during air raids on Berlin and was reconstructed from 1952 up to 1963.